It’s hard to go wrong with flowers. Fresh flowers in the house make me feel better about life. It’s the reason I started a cutting garden. But I’m often rather frustrated with my attempts to arrange what comes out of it. But now, after yesterday, I know better. Because I had the most wonderful Mother’s Day treat, learning how to make a bouquet at the Covent Garden Academy of Flowers, with my daughter Hattie. Put simply, I learnt that the way to approach an arrangement is to make a vase with one hand, add stems at the proper angle and twist as you go. Now, I can’t wait to get going at home. It took the garden I created for my sister to appear in this month’s Period Living for me to finally get my act together. Her house and garden conversion won the Best Renovation Award as part of the magazine’s 2017 Readers’ Homes Awards. Mention was made of the garden along with photos (although it poured with rain on the day the photographer came so the outside shots are a bit soggy!) And I get a name check. And would have got a website address included. But now I have. And this is it. Or at least the link above will take you there. And it’s all my own work. Words, pictures, creation of website using nifty WordPress template. And of course the gardens. There may not be many of them (yet!) but the gardens are all my own work. So take a look. Let me know what you think. It’s been another damp and drizzly week in the garden. Until yesterday, when there were proper blue patches between the clouds, a bit of proper sunshine. And for the first time this year I was able to go outside and do a proper shuffle. I don’t know if you’re familiar with the garden shuffle? It’s one of my favourite things: the slow meander around the garden, usually with cup of tea in hand, not doing, just seeing. It’s when I take the time to properly look at what is happening out there, without feeling I have to do anything about it. (Apart from pulling up the odd weed!) My favourite time to shuffle is first thing in the morning. Ideally the temperature is warm enough for me to go out in my dressing gown. Although we’ve got a while to go before that happens! Yesterday the sunshine didn’t appear until the afternoon, so a dressing gown would have been entirely inappropriate. But still it was warm enough to wander, and within minutes of being out there, cup of tea and me were shuffling in perfect harmony. There’s more to see than you might imagine. Snowdrops are opening, yellow aconites are bright against the brown earth under the ash tree by the drive, the unfolding heads of the hellebores are rising up out of the leaf mould. And yesterday the low sun of afternoon was playing wonderful tricks with the leaves of the Asplenium scolopendrium fern. This is the week that the green shoots have really started to get going, pushing up all over the place, and as I shuffle I’m thinking about all the bulbs I planted last autumn. (One of the great joys of bulb planting when your memory isn’t what it used to be is the element of surprise!) It’s coming back to me that I crammed the recently re-edited centre bed with tulips, choosing my selection after reading an article in Country Life by Tom Coward at Gravetye Manor… but what were they? I can’t remember and I can’t find the article. There are the narcissus I planted under the new hornbeams in the field garden, selected following advice from The Cut Flower Patch by Louise Curley that was my bible last year and will be again in 2017. There are more alliums in the front garden, a row of muscari under the espaliered apples in the vegetable garden. Probably other stuff that I’ve forgotten about. I can’t wait to see what comes up! And this week I’ve been writing lists of plants to buy to fill the gaps I didn’t get round to last year, and I’ve ordered my dahlias, (one of my choices is Otto’s Thrill after seeing it at Petersham Nurseries), and I’m sorting through my seed packets, and watering my pelargonium cuttings. And next week there are roses and wisteria to be pruned, and I’m hoping for another dry day so that I can tidy up the apple trees. And finally, I’ve been getting on with Assignment 3 for the Photography course I’m doing with mygardenschool. One of the topics set for us was still life sequences, shooting the same subject from different angles. This is a shot of a moth orchid I submitted – now I’m waiting for feedback. All in all it’s been a good week. This weekly challenge I’ve set myself for this blog is forcing me to pay attention. And I’m looking forward to seeing what I can find for next week’s post. It’s beginning to dawn on me that my timing may be a little out, it being January, and here I am committed to weekly posts about my garden, which at the moment is grey and gloomy and perishingly cold, and reluctant to offer up too many good stories. But January feels like a good time for a challenge. And I’m telling myself that if I can come up with something to write about for a post at this miserable time of year, and if I can come up with subject matter to shoot for the online plant and flower photography course I’m doing at the moment with the great Clive Nichols at mygardenschool, then it’s going to seem like a piece of cake when things warm up. Oh stop moaning woman and get on with the job in hand. Because the truth is there’s still so much to enjoy in the garden. I just have to brave the elements, whatever the elements happen to be. And even though it’s freezing degrees fahrenheit outside and the ground is rock hard, the plants know that spring is around the corner and they are getting themselves in shape for it. First the Galanthus nivalis, the snowdrops. Never ones to be put off by the cold they are getting ready to flower any day now. Then there’s the Hamamelis x intermedia ‘Arnold Promise’ I planted in the autumn. It’s clustering beautifully and getting ready to put on a show at any moment. One of my all time favourite plants, the Euphorbia characias subsp. wulfenii, which has delivered its structural elegance to the winter garden, is limbering up and preparing to put on it’s lime green loveliness for the benefit of contrast, so that when the tulips and the daffodils and the scillas and the muscari come into flower they have something to work with. I have several strategically placed around the garden. Last year’s mild winter saw it flowering from November. This year we have to wait. But it’s so worth it. The hellebores are getting ready by the driveway. The Sarcococca confusa is wafting occasional bursts of scent, but really wants it to warm up a couple of degrees in order for it to release the full strength of its sweetness. The Daphne odora ‘Aureomarginata’ is laden with buds whose scent is one of the most exquisite of any I know, so that people who rarely notice such things comment as they walk past it to the kitchen door. In the front garden buds are showing on the Amalanchier and the guelder rose and the Prunus. Once you start paying attention it’s amazing how much is happening out there. And inside I’m playing around with reflectors and backgrounds and apertures. And I’m breaking my resolution not to buy flowers because at the moment I have no option. Don’t know what this is but I like it! I can’t wait until the cutting garden starts delivering because this year I’m hoping that I will have much more of a clue about how to take photos of what comes out of it. So… I’ve written myself into a good mood. This week’s post has delivered a whole lot more than I imagined it would. And there’s next week to look forward to. You just never know what’s round the corner. I come home at the end of September after a month away, feeling relaxed and rejuvenated, and full of creative energy. And wondering what to do with it. But before I’ve had time to put away the suitcases and pack up the summer clothes, a project lands in my lap. Completely out of the blue. And it’s a cracker! 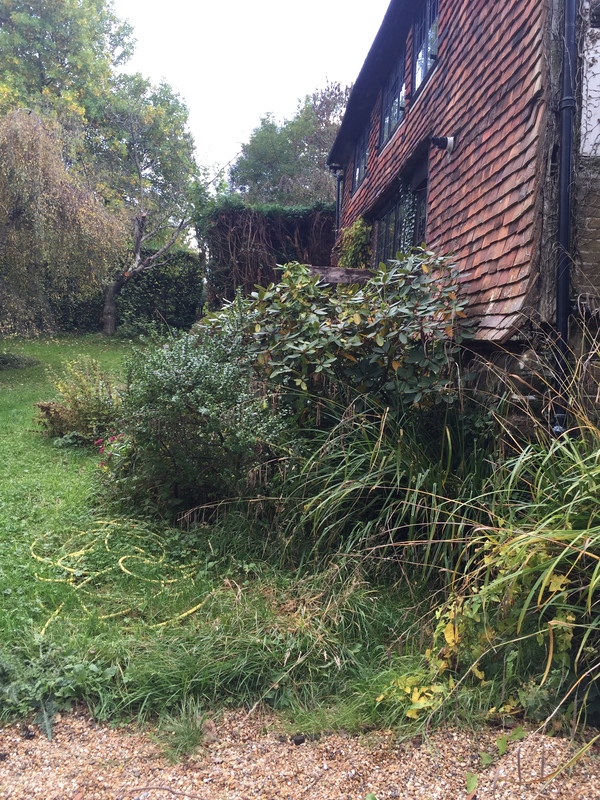 The project is to design the garden for a house on the edge of the Ashdown Forest, a stunning 17th century cottage which is undergoing a transformation and needs a garden to go with it. I couldn’t ask for a better job. But it’s a big deal for me. My first proper project for someone other than myself. Which feels pretty mega… And a little bit scary. But there’s no time to ask myself if I’m up to it. Because it has to be done immediately. Like right this very minute. The situation is that my sister, (who owns the stunning 17th century cottage), has found herself in a bit of a fix. 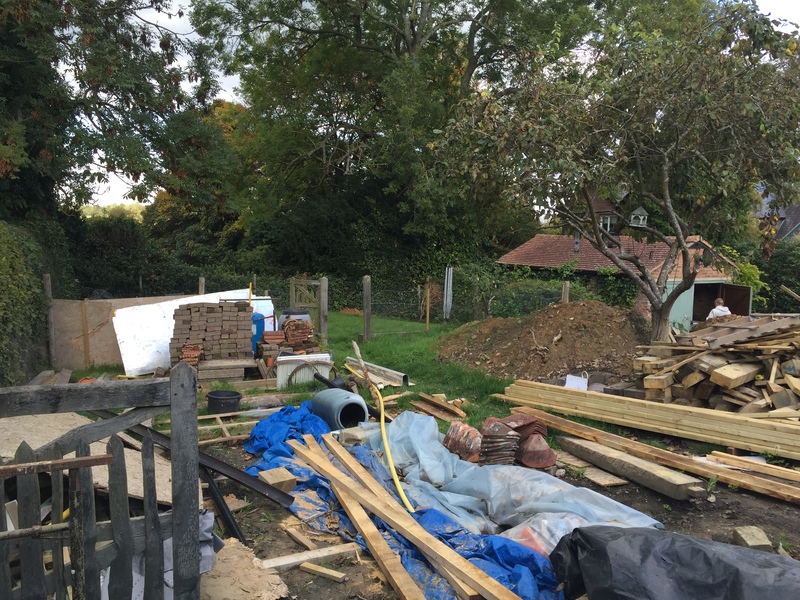 Along with writing cookery books and becoming a bit of a media superstar in the past couple of years, (which you can read all about at https://trufflehound.wordpress.com/) she has been up to her eyes with the planning and construction of an extension for her newly purchased home. 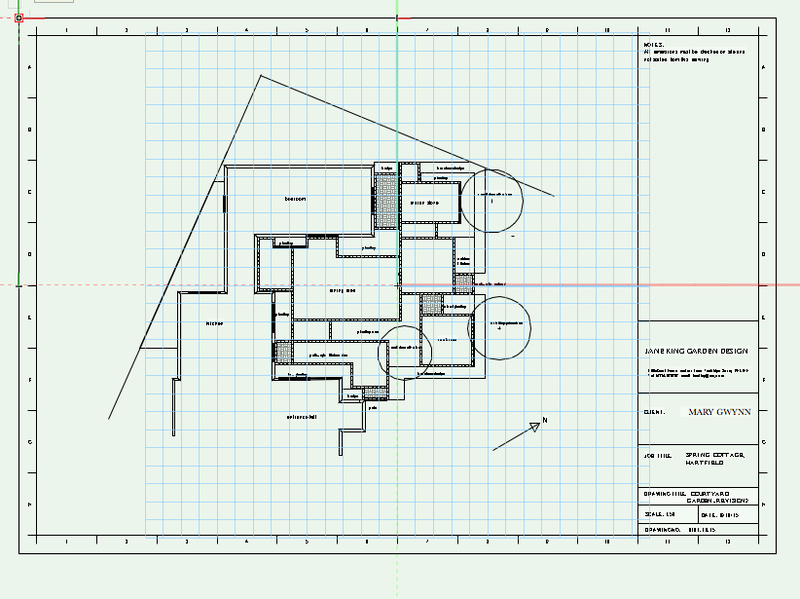 She’s adding a kitchen, and a bedroom and bathroom linked by a glass walkway to the original house. The builders have been hard at work since June. This project started a couple of years ago, when architects were called in to help turn a lovely but impractical house into a lovely but practical one. The lovely but practical house needed a lovely but practical garden to go with it. At the time I was still on my garden design course, and not in a position, time-wise or experience-wise to take on such a challenging job. So my sister briefed other garden designers, and they visited the site and drew up plans for her. But now it comes to the crunch. Because, as tends to happen with these things, plans changed and the build cost went up. Which meant the original plans for the garden were no longer viable. The builders are at the stage where they are ready to start on the outside space. But the original plans can’t be achieved within the new budget. Time to call for the cavalry. In this instance the cavalry is me! We’re talking about the perfect country cottage here: the oldest house in the village, tucked in between the church and the school. The garden folds itself around the cottage like a security blanket. There’s an orchard and a well and an old brick path leading into the churchyard. It’s very very lovely. Or rather… it could be very very lovely. But the cottage was a weekend retreat for the previous owners, and, both inside and out, shows the lack of attention that goes with people not spending much time in it. The architect and builders are doing a great job of turning the building into something amazing. Now it’s time to do the same for the garden. 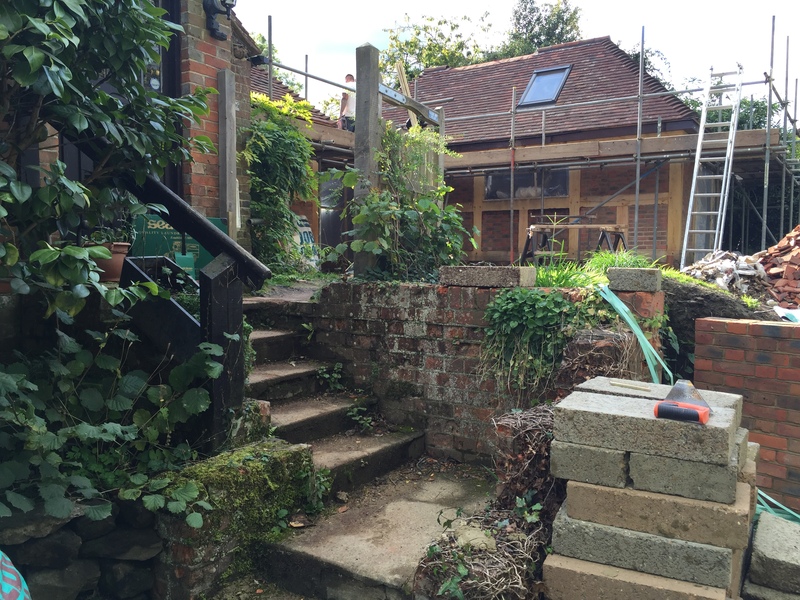 But time is what we have very little of, so I take the site survey away with me, and I get going, and over the weekend I come up with a solution to the most pressing requirement, which is a plan for the courtyard garden in front of the new extension. I turn up at the house on Monday morning, talk my idea through with my sister, who likes it (phew! ), and passes it on to her builders. They begin marking out right there and then. At this stage it’s still on tracing paper. I haven’t even had time to put it on the computer. So I’m hard at work. And loving it. This site isn’t easy – it drops away by several metres from top to bottom, there are gardens to be planned front and back, a request for different areas for sitting and eating and screening needed from nearby neighbours. My sister’s thing is food, so she wants to be able to cook outside, she wants a space to entertain, a separate seating area in front of the downstairs bedroom because she’s thinking about doing bed and breakfast; she wants places to sit and contemplate; and both she and the house demand a cottage style planting plan. All this has to be achieved with respect and consideration for the spirit of this wonderful place. Because this cottage has been here a very long time. The architect and builders have done a superb job of adding an extension that fits perfectly with the old building. 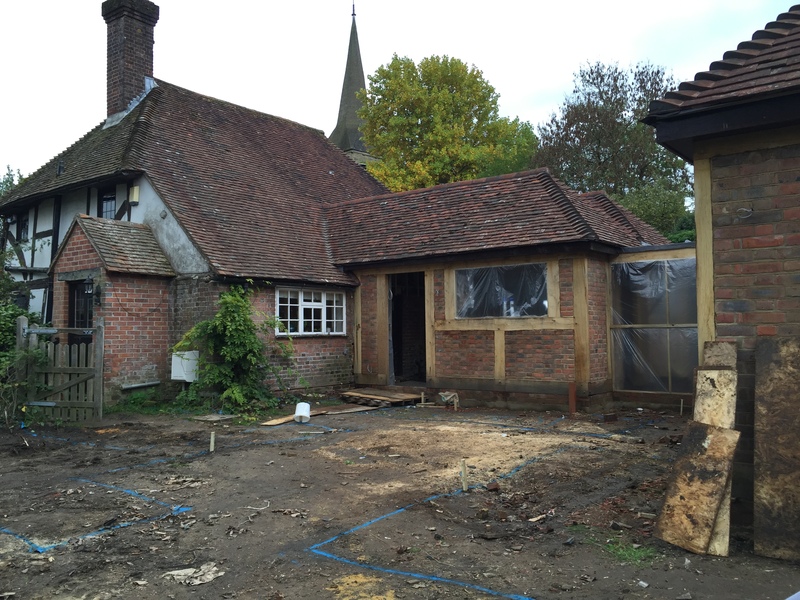 Now this stunning new old house needs a stunning new old garden to go with it. It’s happening before I have time to draw breath. I do get a chance to tweak and make changes. After they’ve started! And I do manage to put the plan into the computer. But there’s been no time for any frilly bits – this is all about producing something that the builders can work from. ASAP! And there’s no time to rest. Because there’s the front garden to consider. And again another plan to be produced at speed, because the builders have to lay a terrace and want to know how and what and where. And then there are the planting plans to be done for the courtyard and the front garden. But it seems to be going ok. My sister is happy. The builders are happy. I’m happy. And on top of that I’ve got a garden to plan for sister number two. Looks like I might be a garden designer after all! The book what I wrote…. Ok folks…. Prepare yourselves…. Because today’s the day. I’ve finally gone and done it. After years of fannying about, self doubting, prevaricating and generally believing that nobody would be interested in reading a book written by me, I’ve taken the plunge. My book. The one I started writing nearly ten years ago, the one I researched and wrote, found an agent for, didn’t find a publisher for, gave up on, picked up again, thought ‘you know what I really like this book,’ self-edited, self-edited some more, found a really cool self-publishing service provided by Amazon, turned it into something that looks like a real book. And now all you have to do is click on this link for Amazon.co.uk and order your copy. If you’re in the US you can click on the Amazon.com link, and you will be able to get it right now. 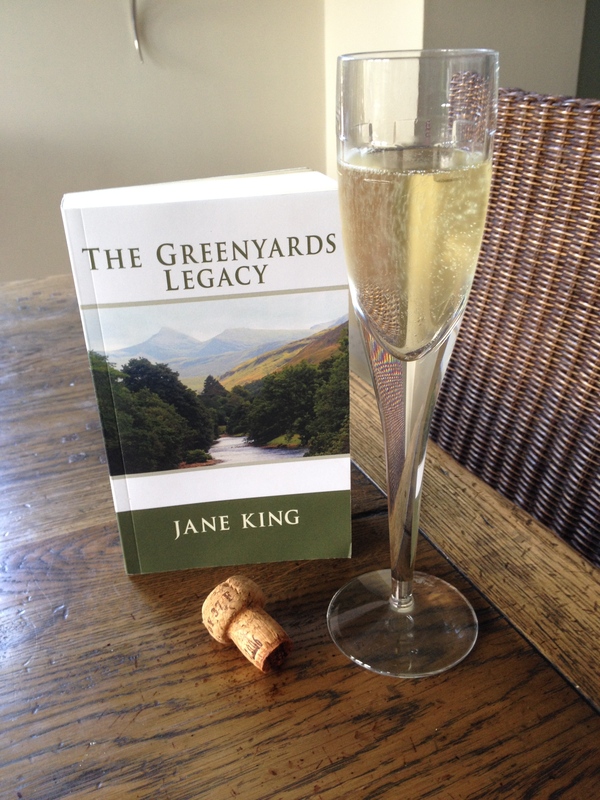 And by August 21st you will be able to read The Greenyards Legacy on Kindle. So there you have it. I really hope you read it. And if you do, I really hope you like it. And if you do, I really hope you tell all your friends and write a glowing review. Hello you poor abandoned blog you…. And I’m hoping that those of you out there, who might have been aware that something was missing in their lives but couldn’t put a finger on what it was, will be sighing with relief knowing that all’s well with the world again. Because I’m back…. And I’m better than ever. At least I hope I am. I’ve been taking a breather. From blogging, from garden designing, from rushing around like a crazy person thinking I should be doing loads of important stuff, from trying to be what I have convinced myself everyone else expects me to be. I’ve given myself some time. And I’ve concentrated on two things. My garden…. That’s my garden. Not other people’s…. Mine. And my book…. That’s my book. The one I’ve been writing for so many years I’ve forgotten when I started it. I had convinced myself it wasn’t good enough. And at the first hint of rejection I abandoned it and left it to fend for itself. But now I’ve gone back to it. I’ve realised it doesn’t have to be perfect. Because nothing ever is. And if I wait for things to be perfect I will end up with nothing. So this is another of my ‘watch this space’ posts. Except for this time the space is going to be filled. Because the manuscript is as good as I can make it. And within a couple of weeks it will be available in print or as an ebook. So you can read it if you want to. I’ll let you know the details. And I really hope you like it. But if you don’t….. You know what. It’s not the end of the world. So it’s back to blogging. Cos I’ve missed it too.